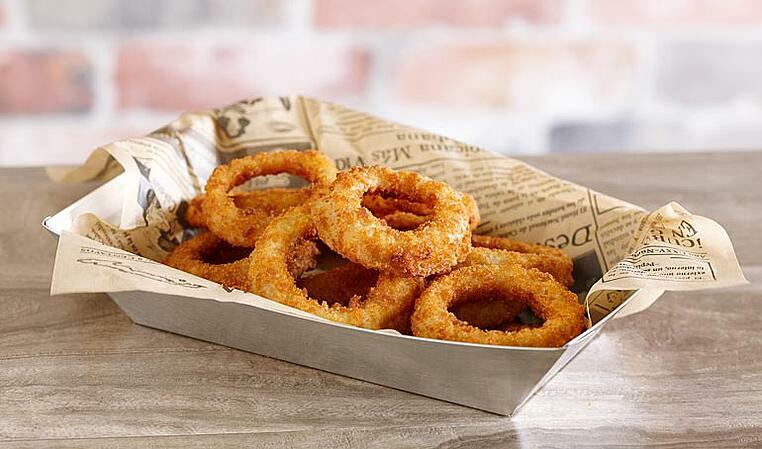 Onion rings: Most folks in America can’t imagine a life without them. These crunchy, sweet, and salty delights are enjoyed by diners at all kinds of restaurants from greasy spoon mom and pops to fast food, fast casual, and casual chains all over the country. 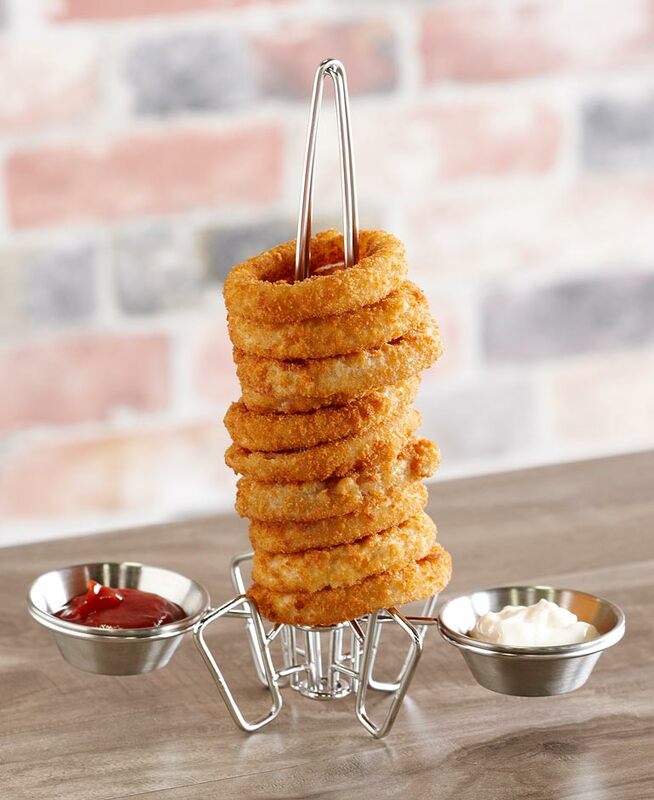 We’ve taken it upon ourselves to orchestrate some creative ways to plate onion rings that fit a variety of styles, themes, and levels of formality. 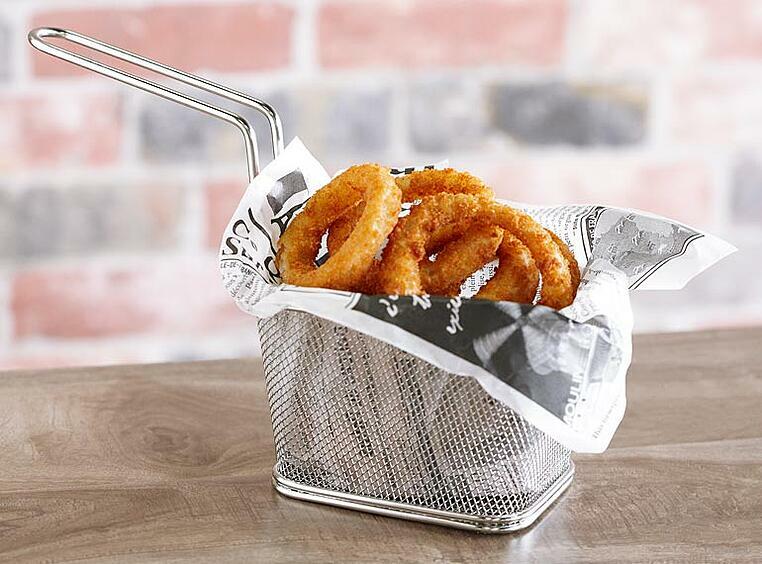 Perfect for seafood houses and any restaurant with an urban industrial theme, add some flair to your onion ring plating presentation with this metal bucket. Incorporate the special ramekin holder by hanging it on the side to highlight a specialty garlic aioli or house-recipe ketchup. Use a food-safe liner with newspaper styling to mimic a British pub setting. Add some whimsy to your tabletop with this unique presentation. The faux wood melamine board works well with a number of popular themes like vintage, urban industrial, and farm to table. It’s a handy board to use in your restaurant because you can repurpose it for other menu items like sandwiches, burgers, charcuterie, and more. The tall spiral is a fun touch that adds character, height, and texture to your presentation. 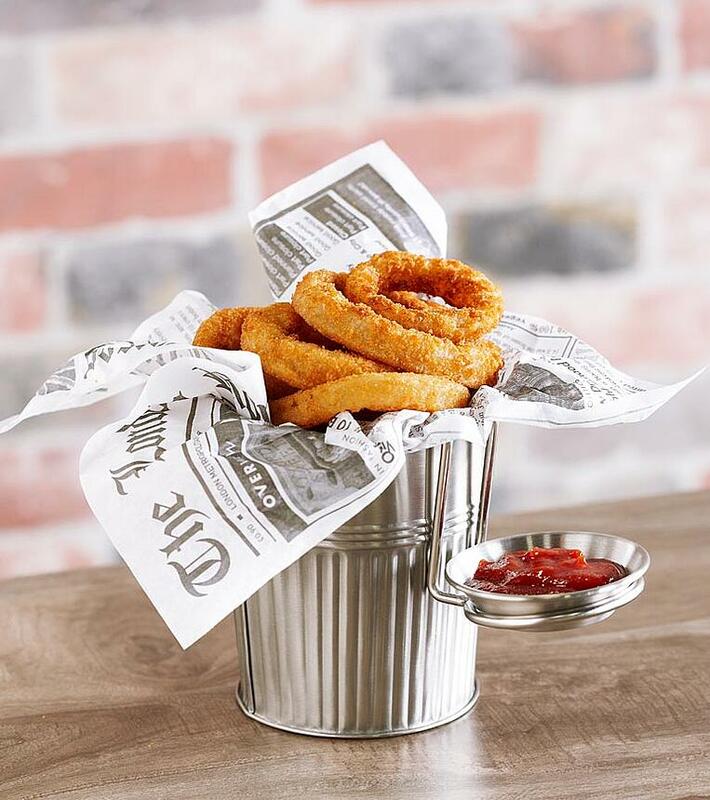 Galvanized metal gives your onion ring presentation a friendly and rustic look. Your guests will be drawn to their tasty treat by the asymmetrical glints on the exterior of the bucket. We see this presentation in a sawdust-on-the-floor kind of establishment. Use a double-open food-safe paper liner for quick and easy clean up. Take control of your reading experience. Leave a comment below telling us what interests you and we'll write about it! Here comes the airplane, open wide! 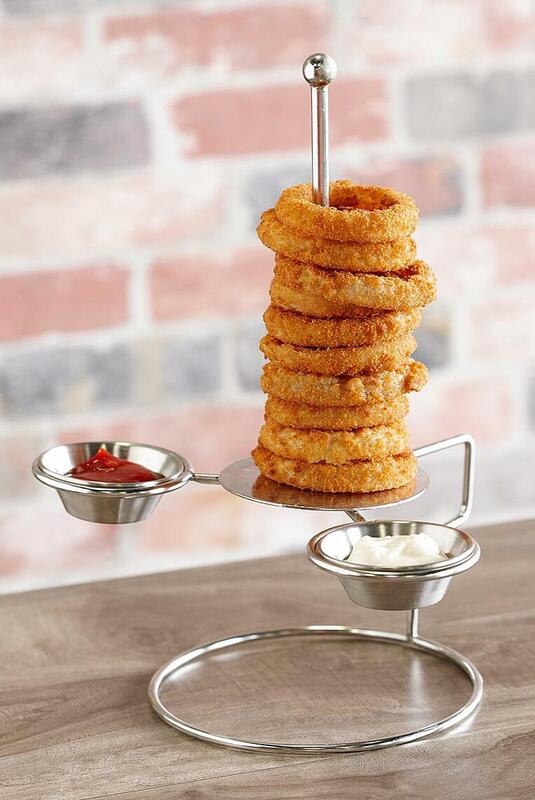 Delight kids at family-oriented establishments with this aviation-themed onion ring stand that's the epitome of fun. Even better, its wings have room for two condiment cups to accommodate the pickiest or most indecisive eaters (and we know they’re out there). This wire metal basket with two ramekin holders is perfect for highlighting your signature sauces. It also makes sharing with the table nice and easy. 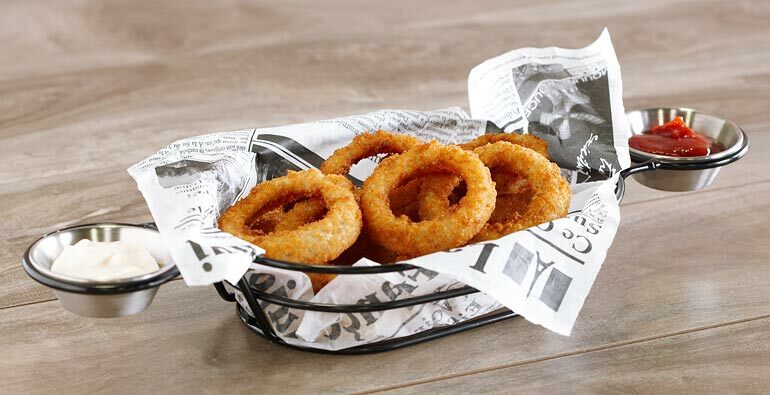 Dress up your onion ring presentation with pub-style food-safe paper to round out the plating. Pass the basket, and no double dipping! 3 … 2 … 1 … blastoff! 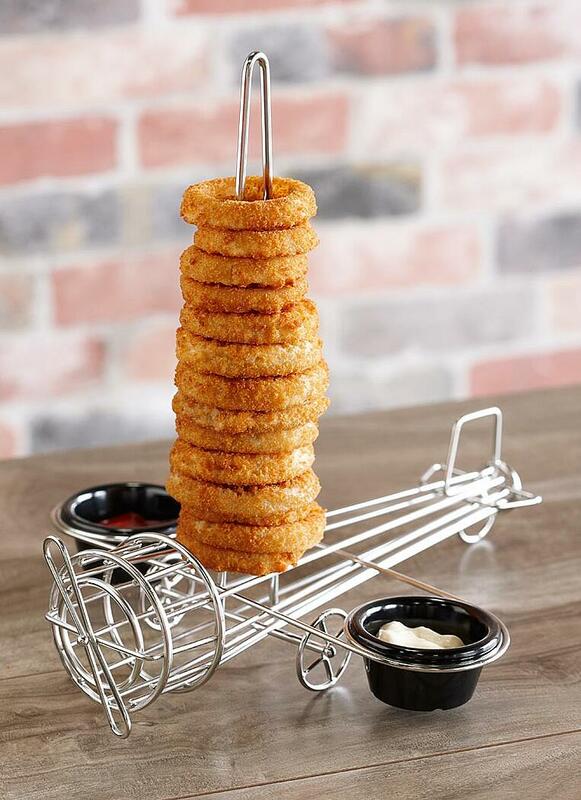 Your guests’ taste buds will take off with this playful rocket-themed onion ring stand. And with two ramekin holders, it’s twice the fun. Use a wire cone metal basket to serve your guests in an unexpected vessel. The shape will help to hold in heat, and the double-open paper liner makes for quick and easy plating in the kitchen. Use the metal ramekin holder to highlight your unique sauce. 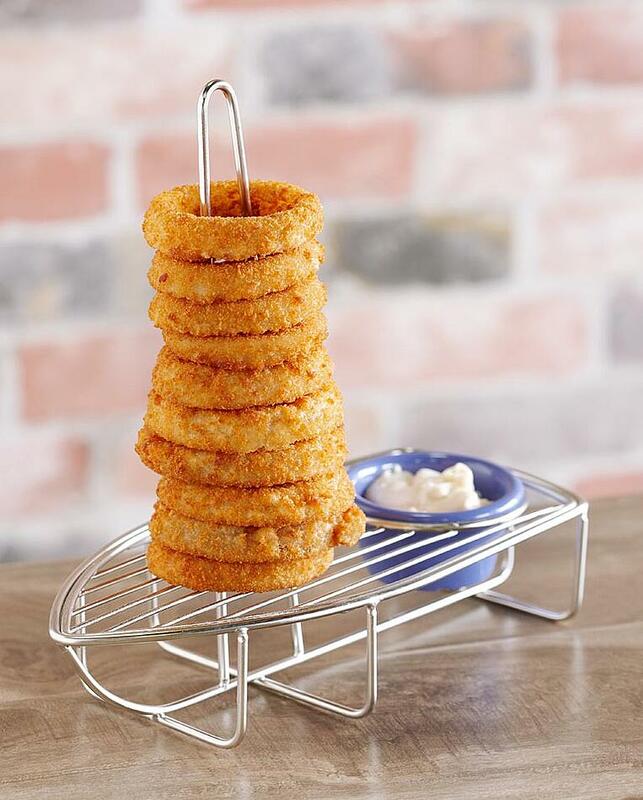 Make space on your table with this sleek, tall onion ring stand. This plating idea is especially useful when you’re tight on table room, and it has the added benefit of two dipping sauce holders that your guests will enjoy. Not finding the answers you want? Leave a comment telling us what we're missing and we'll cover it for you. 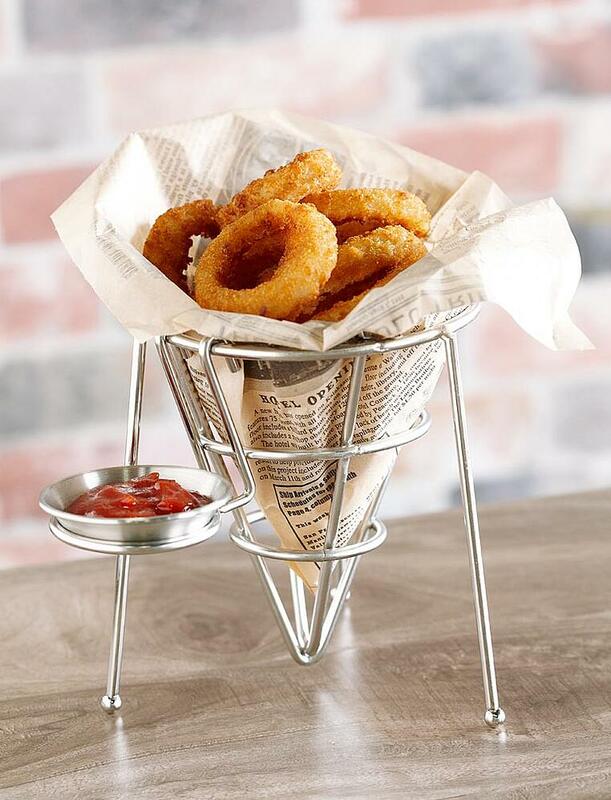 We adore this little fryer basket because it’s like a miniature version of the real thing. Give your presentation some old world charm with food-safe newsprint paper. If your restaurant wants to save money by switching to reusable dinnerware, consider starting with this all-metal boat tray. It's the same shape and size as many popular disposable options, which will make this change an operational breeze. 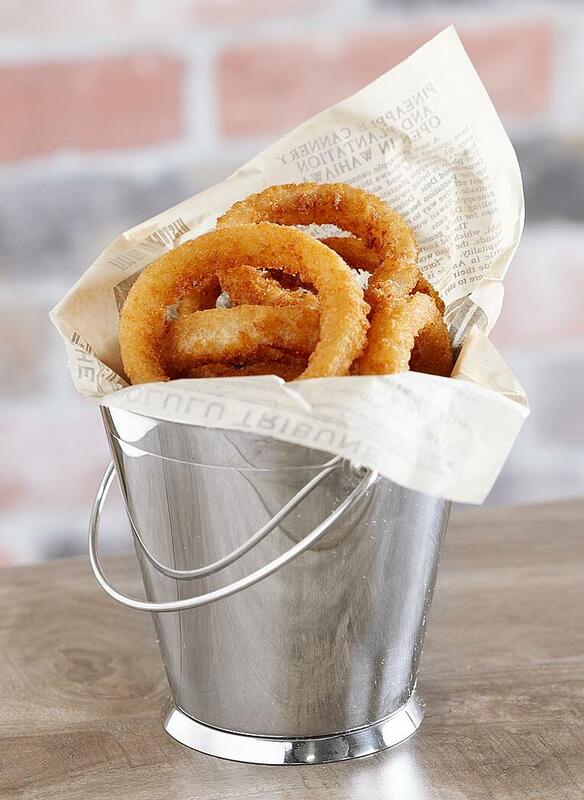 Use brown, food-safe kraft paper to line the vessel and your onion rings are ready to go. Simple as that! 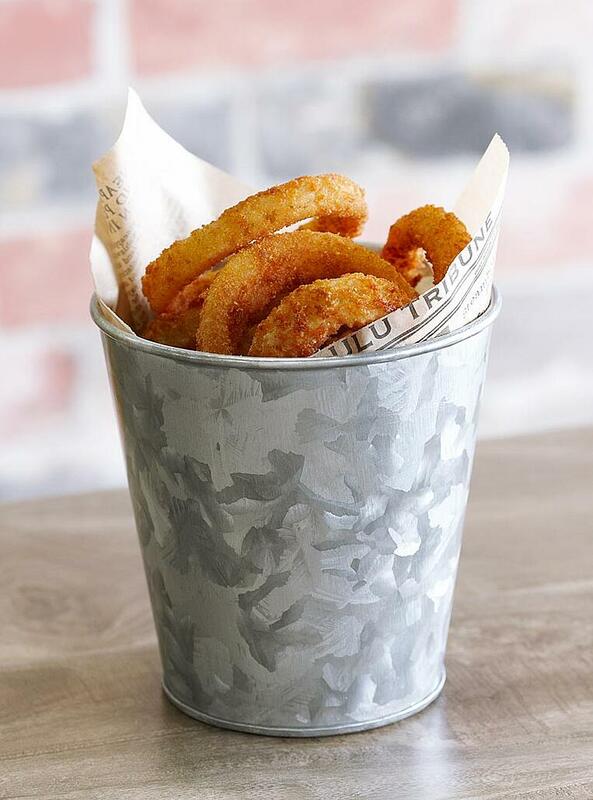 Another great option for a seafood house or farm to table restaurant, this metal bucket features a clean, smooth exterior with a dainty handle. Don’t forget a food-safe paper liner, which not only looks great, but makes for easy cleanup. 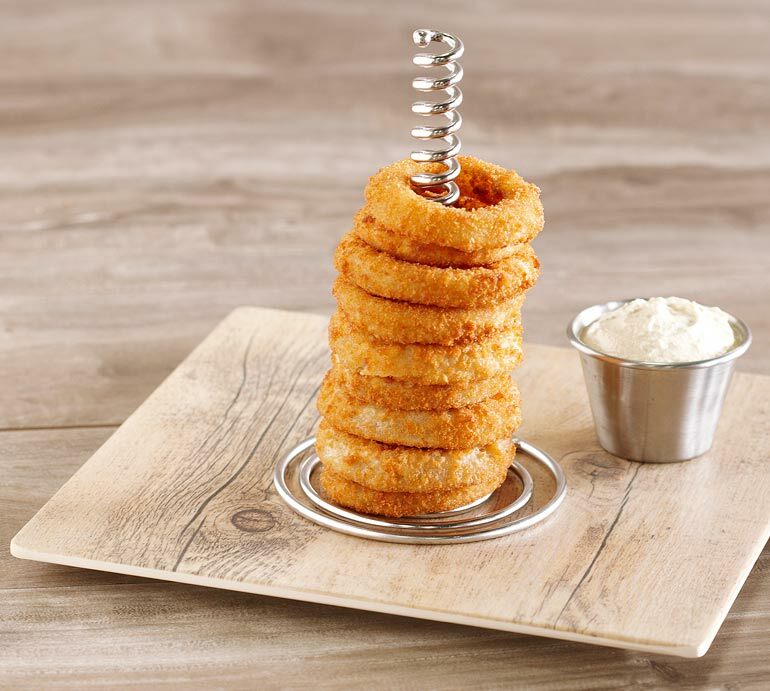 If you enjoyed this tour creative ways to serve onion rings, we recommend checking out other posts in our Serving Ideas section, including imaginative plating options for wings, salad, tacos, and more. Stay inspired, folks!